Inhabitants of Romania have to battle with their fair share of extreme weather occurrences - from flash flooding to snow storms, the remote rural communities often find themselves in need of a special kind of rescue vehicle. 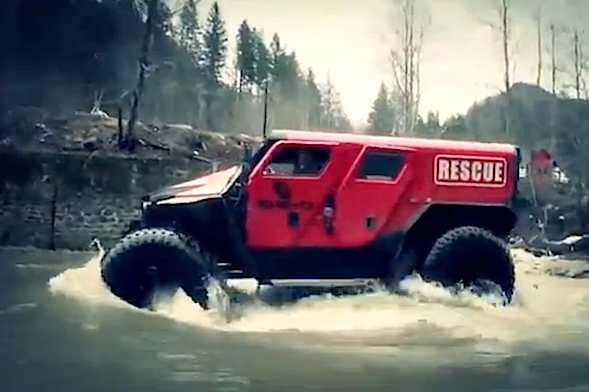 Local speciality marque Ghe-O Motors has created the 'Rescue', a vehicle so hardy it can handle pretty much any surface, weather front and extreme situation Mother Nature can throw at it. The 3.2 tonne behemoth has been designed to be specified by rescue services to suit individual needs. Water pumps can be fitted to transform it into a fire-fighting machine, inflatable pillows added so it can traverse rivers and chains strapped to the massive tyres so it can tackle snowy terrain. A foldable stretcher comes as standard and the off-road monster can happily transport 11 people to safety. There is no real information on drivetrains but expect diesel units that kick out around 300bhp to be the engine of choice, while more powerful petrols can be specified by slightly unhinged (and presumably very wealthy) customers. The video below borders on the cheesy in places but as soon as the Ghe-O Rescue is captured doing its thing, it suddenly become apparent that adding this to your current line-up of automobiles wouldn't be such a bad idea.